Pen-ek Ratanaruang is a name already recognized and respected inside Asian cinema culture. His filmography has gone from less to more, and lately, his level has remained at a very appreciable level. Samui Song is the new film that he directs after “Headshot” from 2011, and “Samui Song” maintains the good stylized quality that film had. It has been 6 years of patient waiting for us to see a new movie of his, but to be honest, it was worth it. Pen-ek Ratanaruang is sometimes known for mixing different genres, like in “6ixtynin9” or in Last “Life in the Universe”, where he mixes drama with comedy. 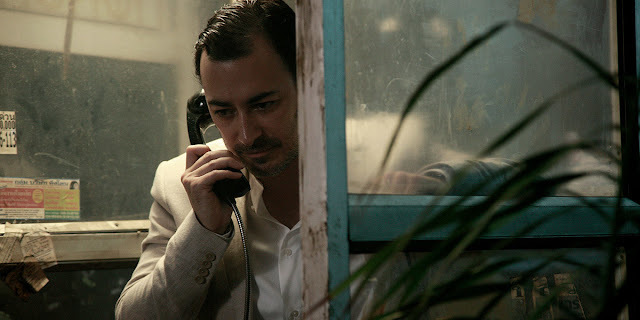 Here, Pen-ek Ratanaruang is more focused and tells the story in a stylized noirish way with some thriller elements, as it occurred with his previous film “Headshot”. Samui Song is about Viyada (or Vi), a well-known soap opera actress who is married to Jerome, a wealthy Frenchman, and they live together in Thailand. Everything would be great for them if it weren’t for Jerome’s involvement in this cult where they have idolized this cult leader played by Vithaya Pansringarm. One day, after Vi had suffered this car accident and finds herself healing in the hospital, Vi has a casual conversation with a mysterious man named Guy, who indirectly suggests getting rid of her husband and her mistreatment due to this dangerous cult. Both films have a very similar style. The director decides to follow the footsteps of the Neo-Noir style, and on this occasion take it to a more classic level. “Samui Song” is a brilliantly shot and directed film, narrated with wit and with a lot of attention to detail. Both the cinematography by Chankit Chamnivikaipong and the editing by Patamanadda Yukol is very cared and studied. Both things complement each other wonderfully because this is one of those films where the images narrate what is happening instead of having so much dialogue. The pacing, on the other hand, is very well measured and it doesn’t drag at any time. It remains firm and dynamic during the one hour and forty minute runtime of the film. The film maintains this tense and dark atmosphere throughout the runtime, and this is something that keeps the viewer in suspense and wonder during it, also thanks to the fantastic and gorgeous cinematography. The film plays a lot with depth-of-field and some close-ups. It is a very visual and attractive film, something that in itself adds many points, and if we add that the plot is very interesting, we have the complete package. The performances are all great, starting with our main protagonist Chermarn Boonyasak, who we notice a little cold at times, but that is a profile which is perfect for this type of noirish films. Vithaya Pansringarm and Stéphane Sednaoui are also good and believable, but the star of the show is actually David Asavanond, giving a very classic and charismatic touch to his performance with this cheat character. It is clear that the actor is comfortable with the role, because he nails it in all the moments he appears on screen, and he adds a little touch of elegance and even humor to the film. “Samui Song” is a neo-noir thriller with a very classic touch that will not disappoint film lovers. Well directed, well narrated and well performed, “Samui Song” is a bet worth seeing and worth contemplating.